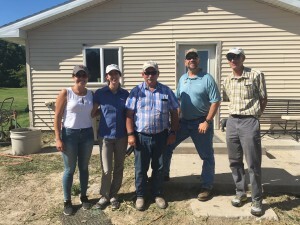 My team and I traveled to Nebraska earlier this month to meet with a few corn and soybean farmers to get a sense of what the costs and benefits might be of dedicating some acres – namely marginal lands with low crop productivity, as well as roadsides and field edges – to growing milkweed habitat for the monarch butterfly. What we found was that there is no one-size-fits-all approach. Gale Larson is a retired corn farmer near St. Paul, Nebraska, who rents out portions of his property for farming and grazing. A few years ago, Gale decided to enroll a significant portion of his property into the Wetlands Reserve Program (WRP) to provide high-quality aquatic wetland habitat to support local plants and wildlife. 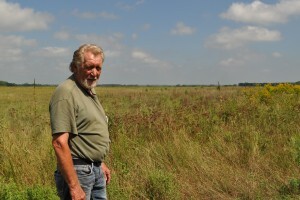 Gale Larson stands next to former cropland that now provides habitat to monarch butterflies and other local wildlife. “Somebody’s got to take care of this stuff and I had the opportunity to do it, so I did it,” Gale said. Gale added that he wants to leave a good legacy for his kids and grandkids. But in the meantime, he is enjoying the scenery. 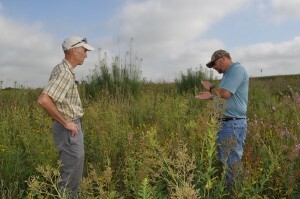 Gale coordinated with local USDA biologists and pollinator habitat experts from Pheasants Forever to maximize the conservation potential of his WRP acres. In addition to taking the land out of corn production, Gale planted a high-quality seed mixture with over 200 species of plants designed for his soil type. Using prescribed fire and cattle as management tools, Gale can keep the land rich in biodiversity, attracting bees, butterflies and birds. That became clear when we visited Paul Kenny. Paul Kenny (center) poses for a group photo with staff from EDF and Pheasants Forever. About an hour’s drive west from Gale’s farm is Paul Kenny’s farm, which spans 4,000 acres in Amherst, Nebraska. The property has been in Paul’s family since 1882 and has grown into a family business supported by Paul’s three sons. Both a savvy businessman and a steward of the land, Paul makes decisions about his farm, from seed type to grazing rotations, based on return on investment, as well as on sustainability. So in thinking about what it would take to dedicate some of his property to monarch conservation, he was honest about what would work for him at the scale of his operations. “A third of an acre isn’t going to be worth the trouble for me or any farmer,” Paul said. “But multiple small patches might work,” or ideally a larger area that isn’t already utilized. Paul drove us to a viewpoint on his property where we could look out at a vast number of acres currently enrolled in corn production. Off to the right Paul pointed out a small hill covered in grass and trees. No corn. No cattle. We thought collectively: Might that be a good place to plant milkweed? It might, but it would require some extra work and possibly extra equipment – all things Paul might consider investing in if offered the right incentives. Pete Berthelsen, a biologist and pollinator expert from Pheasants Forever, shows me some high quality pollinator habitat he planted and manages in St. Paul, Nebraska. As my colleagues at EDF and I, along with our partners in the science, ag and conservation communities, work to develop solutions for engaging large-scale agriculture in the effort to recover monarch butterflies, we will continue to work with landowners like Gale and Paul to understand precisely how and where investments can be directed to get the most bang for the buck, and for the butterfly. The conservation potential is there, it’s just a matter of finding it and tapping into the right places at the right time with the right approach. I am hopeful that these relationships will contribute to greater understanding and greater opportunity for monarch conservation. Our next stops? Iowa and Minnesota. This entry was posted in ecosystems, Habitat Exchange, Wildlife Protection and tagged agriculture, conservation, corn farming, environmental defense fund, habitat exchange, monarch butterfly, Nebraska, NRCS, Pheasants Forever, USDA, wetlands reserve program, wildlife. Bookmark the permalink. Both comments and trackbacks are currently closed. Nebraska is the perfect place to recreate ecosystems for the Monarchs. The Monarch’s formally fluttered around all over the place when I was a child in the late 60’s early 70’s. Equally important, I think the EDF needs to educate homeowners & give them incentives to plant milkweed & other indigenous plants in their yards. I recently have done so myself. I was surprised at the variety & number of butterfly’s & bees that have showed up. Moreover there are grasshoppers, crickets & other bugs that are in the yard for the first time ever. This provides bugs for the birds to eat that they didn’t have before. Therefore it creates quite a circle of life support within a 6,000 square foot area. 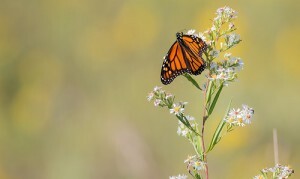 Research by scientists from the Universities of Iowa and Minnesota in 2012 suggest that a loss of agricultural milkweeds is a major contributor to the decline in the monarch population. While there are a number of threats facing the monarch butterfly, including harsher winters in monarch overwintering sites and erratic weather, it is important to maintain corridors of suitable monarch and milkweed habitat, and ensure that other pressures on their populations are minimized. Both milkweed and flowering plants are necessary for the monarch. From what I can see in the videos you shared, there may not be enough floral resources nearby to support adult butterflies. Credits generated through a habitat exchange incorporate measures of milkweed and nectar resources, ensuring high quality habitat.